Look, there’s no need to be shy about it. We get it. That tattoo seemed like such a good idea at the time, but now it doesn’t feel like anything except for a badge of shame that burns into you day after day. Or maybe you’re not ashamed of it at all, and you just want something new or need to clear up your ink for a job. Whatever the reason is for wanting to get a tattoo removed, it’s important that you understand some of the facts! Tattoos are, in fact, designed to be permanent, so you have to keep your expectations in check when you go in for removal. It’s an advanced process that’s not nearly as simple as the name implies. At Rejuvenation Medi-Spa, we have long offered tattoo removal services to the people of the Prince Frederick and La Plata areas. Throughout the years of serving countless customers, we’ve taken note of some things that people are most often ignorant of. 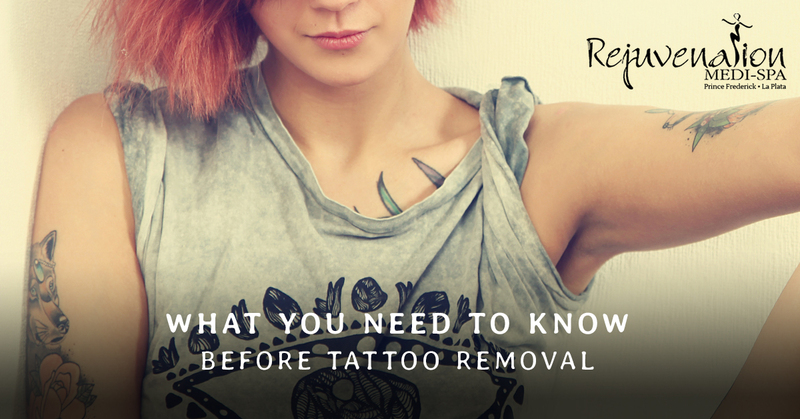 Before you go in for tattoo removal services, here are some things you should know. Location: It suffices to say here that the more circulation your tattooed region gets, the better. Tattoos heal better when they get healthy circulation. For an easy way to think about it, just ask yourself how close your tattoo is to your heart. The closer it is to your heart, the more it’s going to heal. Colors: Tattoo removal uses advanced laser technology to remove the pigments deeply embedded in your skin. Unfortunately, different colors respond to different wavelengths, so you’ll have to have a chat with your tattoo removal professional to see how your own colors will fare against their machines. Fortunately, at Rejuvenation Medi-Spa, we use PicoSure lasers, which are the most effective at eliminating a variety of colors. Quality: The competence of your original tattooer plays into the ease of removal. On one hand, professional tattoos are much more evenly distributed throughout your skin, making the removal process more consistent and predictable, and therefore easier. On the other hand, professional tattoos tend to use far more saturated ink, which is more stubborn in its removal. Amateur tattoos are often unevenly applied, complicating the removal process, as the “weaker” ink puts up less of a challenge to the lasers. Age: While tattoos are permanent, you don’t have to spend a lot of time around tattooed people to realize that they are affected by age. Your brand new tattoo won’t look quite as crisp and vibrant ten years down the road because your skin has absorbed some of the pigment. In essence, older tattoos are easier to remove than new ones. If you think that tattoo removal is a simple one-and-done process where you just walk in, get zapped, and walk out with brand new baby skin, you might want to consider looking up your local wizard instead, because only magic could make it that easy. For the overwhelming majority of patients, tattoo removal is not a one-time deal. Tattoos penetrate deeply into your skin and are loathe to come out without a fight. Multiple treatments are typically required to give the skin time to recoup after the procedure. Expect the tattoo removal services to require at least two visits, though for certain challenging tattoos it might take four trips or more to your local medi-spa. The act of tattooing can actually scar your skin, but this is something that isn’t easily noticed because it’s masked by the tattoo. When you remove said tattoo, you might find that your skin isn’t the same as it was before. This is the “ghost” effect that’s often left behind in tattoo removal. It’s not a guarantee, but scarred skin that looks and maybe even feels slightly different is definitely a possibility. One thing that tattoo removal machines do is remove the pigment from the skin. This eliminates the tattoo but unfortunately, your skin itself has its own pigment which can be destroyed by the tattoo removal machine, leaving your skin lighter. The good news is that this tends to correct itself over time. The bad news is that you’re not looking at a few days; it’s more like a few months. Stick it out — it will all be worth it in the end! While this list might make tattoo removal services sound scary, the truth is that it’s a safe and reliable process, and at Rejuvenation Medi-Spa, we take every possible step to ensure that you’re receiving the best treatment that our technology and expertise allows. Got more questions about tattoo removal? Don’t be afraid to contact us with your questions! Our experts will inform you about our tattoo removal technology and evaluate the potential removability of your ink. If you’re in the Prince Frederick or La Plata areas, stop by today!